Spatial distribution of head scales. (A) Head scales in most snakes (here, a corn snake) are polygons (two upper panels) with stereotyped spatial distribution (two lower panels): left (yellow) and right (red) scale edges overlap when reflected across the sagittal plane (blue). 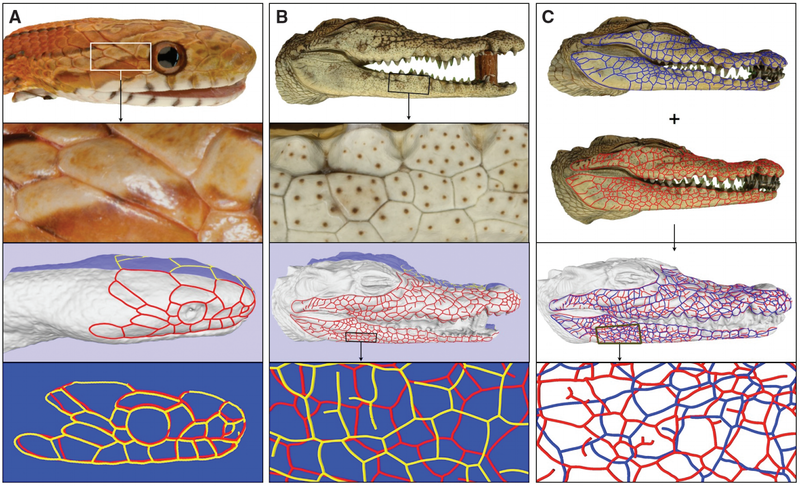 (B) Polygonal head scales in crocodiles have a largely random spatial distribution without symmetrical correspondence between left and right. (C) Head scales from different individuals have different distributions of scales’ sizes and localizations (blue and red edges fromtop and bottom crocodiles, respectively).